If you are looking for a powerful laptop like your desktop then definitely you need to go with the best intel core i7 processor laptops because it is one of the most powerful laptops than all other Intel processor laptops like i3 or i5 processor laptops. The i7 processor laptops are the perfect portable and powerful machine which can handle all the heavy tasks like intense gaming, 3D Modeling, AutoCAD, photo/video editing, music production, etc. Actually, i7 processor laptops are expensive than Intel Core i5 processor laptops, so if you don’t have a much budget then you can go with i5 processor laptops which is also a good performer at an affordable price. Before we go further we just want to ask you that do you really need an i7 processor laptop? If yes, then just go with that. There are millions of laptops are powered by the Intel Core i7 processor throughout the world and still, the i7 processor is one of the best for the desktop-class performance. But the performance of every i7 processor laptops is different from each other it is because the i7 processor is available in different series. If you don’t know about this then don’t worry we are here to help you and clear your all the doubts. Which Intel Core i7 Processor Series Laptop is The Best For You? Before you are going to buy an i7 processor laptop first you need to understand each and every Intel Core i7 processor model and then choose wisely. Now you may understand that for choosing the i7 processor from the series you need to consider its number of cores and threads, base and turbo frequency, cache and integrated graphics and then choose which is suitable for you. In the above table, you may have noticed that there are U-Series and H-Series i7 processors. So here I just want to give you a tip, let’s have a look. If you are looking for a laptop for multitasking work and also for occasionally gaming, then I suggest go with the U-Series i7 processor which comes with 8MB cache memory. This U-Series i7 processor is perfect for your day to day tasks and also it is less expensive than the i7 hexacore processor. And if you want a laptop for heavy multitasking or for intense gaming then I suggest you go with the H-Series i7 processor which comes with 9MB cache memory. This (H-Series) hexacore processor is powerful enough to handle all the latest gaming titles, large video editing file, etc. After going through the above guide we hope now all your doubts are cleared and also you may have got an idea about the i7 U-series and H-series processor and you can choose yourself which one is perfect for you. 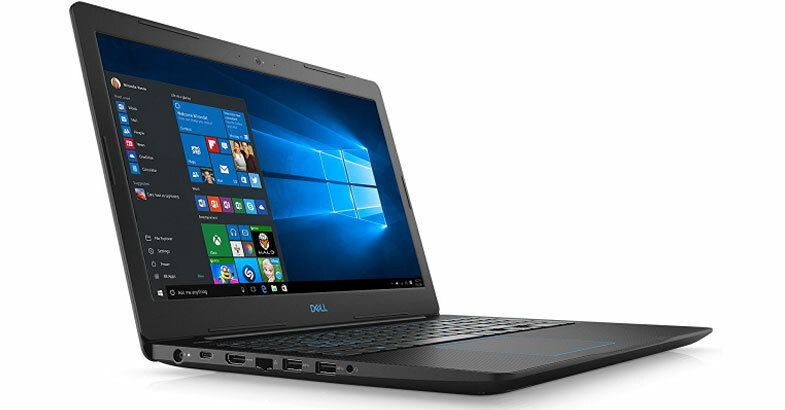 Let’s begin this list with Dell G3579-7989BLK-PUS laptop as Dell is one of the most trusted laptop brands. If you are looking for a gaming laptop which you can use at your workplace or school/college then this is one of the best options for you as it has not got a gaming look. This Dell laptop has got a premium look and feel, which finished in black metal with blue accents. The display size of this laptop is 15.6-inch of full HD IPS Anti-Glare LED-Backlit display which provides sharp visual from virtually every angle. This device is powered by the latest 8th Gen Intel Core i7-8750H processor and coupled with 16GB of RAM. It provides powerful performance if you are gaming or working on CPU-intensive projects. The graphics of this machine is handled by the 4GB of NVIDIA GeForce GTX 1050TI dedicated graphics card, which gives more immersive on-screen experience. Thanks for providing dual storage such as 256GB Solid State Drive + 1TB Hard Drive storage, which ensures faster performance and better reliability. To keep the system cool in under pressure it has dual fans which helps you to experience uninterrupted working or gaming. This Dell laptop runs on the Windows 10 operating system and got all the required ports and slots. If you have a limited budget and looking for an i7 processor laptop then under $800 budget this Acer Aspire E 15 is perfect for you. 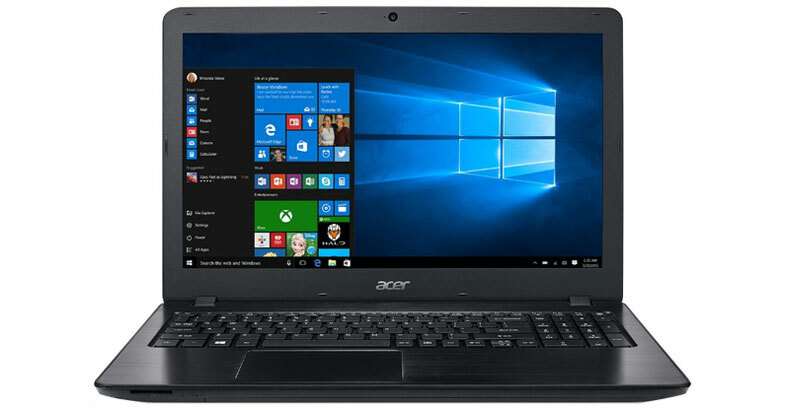 This Acer Aspire E 15 is one of the best selling budget laptop from the last two years. Let’s talk about the laptop then it sports in 15.6 inches of full HD IPS Widescreen LED-Backlit display which delivers accurate colors from a wide viewing angle. This laptop is powered by the 8th Generation Intel Core i7-8550U processor which gives more power, more battery life, and more high-quality entertainment on the go. To take care multitasking on this device it has got 8GB of DDR4 RAM which is good enough for your day to day normal multitasking and casual gaming. This laptop runs on the Windows 10 operating system and houses with 256GB of SSD drive, which gives you faster performance than the HDD drive. Thanks for providing NVIDIA GeForce MX150 graphics with 2GB of dedicated memory. For better multimedia experience, the audio system of this laptop is powered by the Acer TrueHarmony. And the best part of this laptop is you can easily upgrade the Hard Drive and Memory with its convenient compartment door. If you are a traveler and looking for a thin and light laptop then ASUS VivoBook K570UD is the best choice for you. If we talk about the design of this laptop, then VivoBook K570UD sports an eye-catching look with a smart and sophisticated Reaper Black finish chassis accent by Lightning Blue edges. It has wrapped all the powerful set of configuration in 0.86-inch thin profile and the overall weight of this notebook is 4.2 pounds makes it one of the lightest high-performance VivoBooks. It comes with 15.6-inch of full HD IPS Wideview display and it combines optimized hardware and software to provide crisp and clear visuals. And also it has ASUS Splendid display technology which provides richer, deeper and more accurate colors for any type of content. This VivoBook features with the incredibly powerful 8th Gen Intel Core i7-8550U processor and for effortless multitasking, it is backed by 16GB of RAM. For flawless graphics visuals, this notebook is equipped with NVIDIA GeForce GTX 1050 graphics with 4GB of dedicated VRAM. If you are concerned about the storage of this device, then it comes with 256GB SSD + 1TB HDD, which is good enough to store all your files and data. 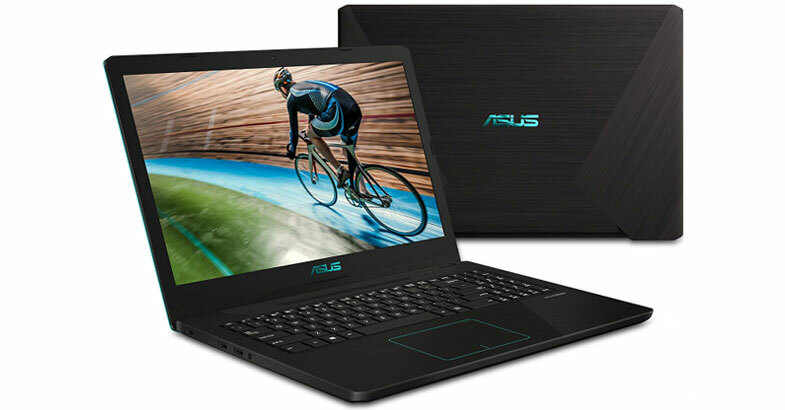 Moreover, the best feature of this laptop is it has ASUS fast-charge technology, which helps to charge a low battery to 60% in just 49 minutes. And the better life is also good which provides up to 9-hours of battery backup on a single charge. For the connectivity, it comes with all the required ports and slots. Note:- If you like the above ASUS VivoBook K570UD thin and light laptop but you don’t have that much of budget then this ASUS VivoBook S is for you which cost you around $800. But this VivoBook is not powerful than the above one. This ASUS VivoBook has got 14-inch of full HD WideView display which provides stunning visual from up to 178° wide-viewing angle. This compact notebook is powered by the 8th Generation Intel Core i7-8550U processor and paired with 8GB DDR4 RAM. And to handle graphics on this device it comes with 2GB of NVIDIA GeForce MX150 dedicated graphics card. And the storage of this device is managed by 256GB SSD drive. Interesting features of this device is its backlit keyboard with a fingerprint sensor. 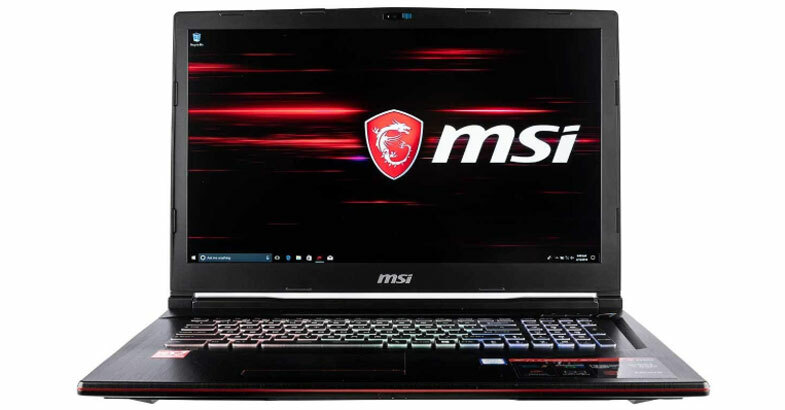 If you are looking for an i7 processor powerful gaming laptop from a dedicated company then I suggest you go with this MSI CUK GP73 Leopard laptop. If you love to work or gaming on a big display then you definitely like this laptop as it has got 17.3 inches of full HD Wideview Anti-Glare display with 1920 x 1080 pixels of resolution. And its anti-glare screen will never distract you from the glare during gaming or working session. This gaming laptop is powered by the latest 8th Gen Intel Core i7-8750H Six-Core processor with 9MB Cache and turbo boost up to 4.1GHz. To handle today’s challenging graphics-intensive games it comes with NVIDIA GeForce GTX 1060 graphics with 6GB of a dedicated co-processor. With this notebook, you will not face any storage issue as it comes with 500GB NVMe SSD + 1TB HDD. And its NVMe SSD is 4-times faster than the SATA SSD and also helps to load applications faster and run demanding programs without lag. It is equipped with 16GB of DDR4 RAM to deliver you a smooth multitasking working experience. The keyboard of this laptop is full size and the best thing is that it is designed especially for professional gamers needs. It has got all the essential ports and slots such as 1 x USB 3.1 Gen 2 Type C, 2 x USB 3.1 Gen 1, 1 x USB 3.1 Gen 2, 1 x Mini DisplayPort, 1 x HDMI, Microphone in, Headphone out and microSD card reader. This Acer Predator Helios 300 is the best selling gaming laptop from the last few years. Under $1200 budget segment this Acer laptop comes with all the latest and powerful set of hardware configuration like its predecessor. This laptop is specially designed for those with a need to speed. 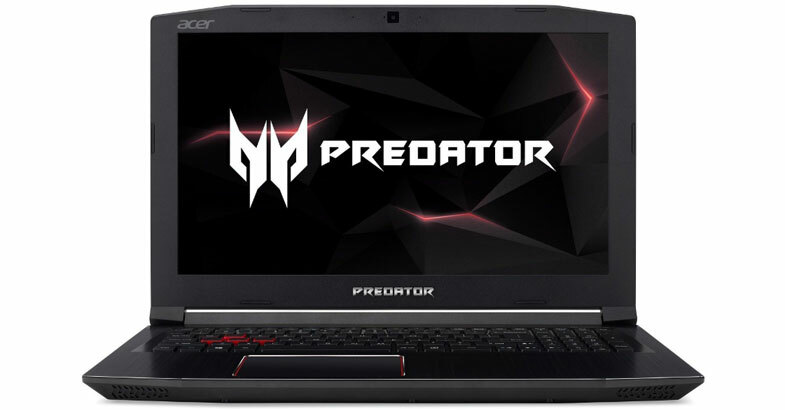 As a gaming laptop, this Predator notebook features the PredatorSense gaming control panel, which provides customization and control of gaming features which includes system temperature, CPU fan speed, and system fan speed. It comes with devastatingly powerful 8th Gen Intel Core i7- 8750H 6-Core processor and turbo boost technology up to 4.1GHz. For superfast loading speed, it is equipped with fast 256GB NVMe SSD and 16GB DDR4 RAM which accelerate boot-up times and shorten in-game loading times. 256GB of storage space is not enough for many but if you want to expand the storage space then you can able to do through its extra empty accessible slot of 2.5-inch for the hard drive or SSD. For full throttle gaming acceleration it has got NVIDIA GeForce GTX 1060 overclockable graphics with 6GB of dedicated GDDR5 VRAM. 15.6″ inch Full HD Widescreen LED-Backlit display with IPS technology, sRGB color gamut that allows to see the visual with consistent and brilliant color from any perspective. The audio of this laptop is powered by the TrueHarmony and Dolby Audio Premium which deliver immersive sound and special effects with increased clarity. One of the best things about this gaming laptop is it is VR ready so you just need to plug in a VR headset and step into a new world. This Dell G5 15 5587 is another laptop from the Dell and the G series laptops are specially built for gaming with powerful config. 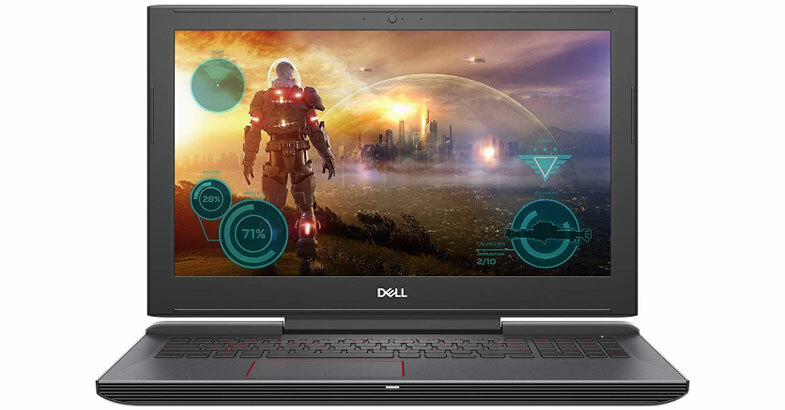 This Dell laptop sports in a Licorice Black with a red accent which gives it to full gaming feel. It has got 15.6-inch of full HD IPS Anti-glare display which delivers stunning clarity and superior color richness. For a processing powerhouse, this laptop is powered by the Intel Core i7-8750H with 9MB cache and turbo up to 4.10GHz. For multitasking on this device, it is backed by 16GB DDR4 RAM, which is further expandable up to 32GB via its additional memory slot. On the storage front, it has got combo storage segment such as 128GB SSD + 1TB HDD. To turn your laptop into a true gaming rig it is equipped with 4GB of NVIDIA GeForce GTX 1050 Ti dedicated graphics card. For superior sound and experience of every beat of the action, it comes with two tuned front-firing speakers which are powered by Waves MaxxAudio. The best feature of this laptop is its quick-charge technology which increases battery by 25% in 15 minutes. The keyboard of this laptop is a full-size backlit keyboard which is built with multiple layers of reinforcement. 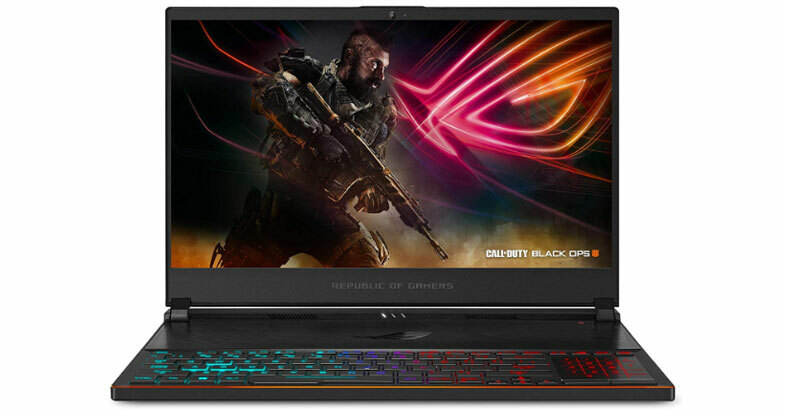 ROG is a dedicated gaming laptop series from ASUS and this ASUS CUK ROG Strix Scar GL703GM is one of them. So if you are looking for an i7 processor dedicated gaming laptop then this is the best gaming machine for you. 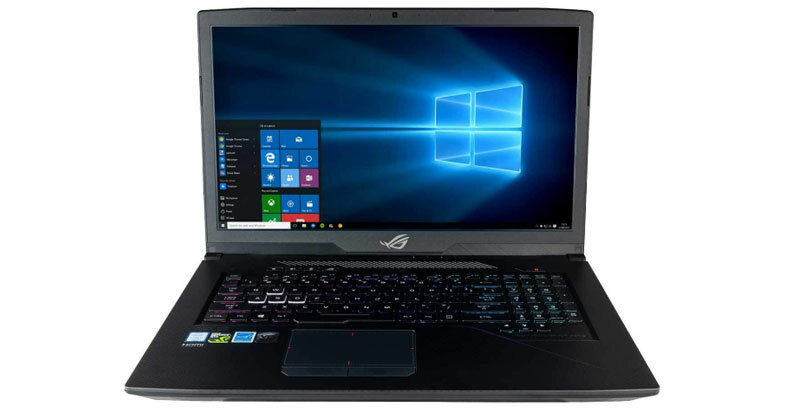 If you love to play games on a bigger display then definitely you need to go with this laptop as it has got 17.3 inches of full HD Matte display with having 1920 x 1080 pixels of resolution. The Strix Scar Edition series laptops have high refresh rate displays. Higher refresh rate displays deliver multitude frames within the same amount of time as compared to standard 60Hz displays. To handle AAA titles games it is powered by the latest Intel 8th Gen Coffee Lake i7-8750H processor and paired with 16GB DDR4 RAM. For brilliant visual graphics for AAA titles games, it has got NVIDIA GeForce GTX 1060 graphics with 6GB of dedicated memory. To store your all game, software, picture, videos, it houses with 500GB NVMe Solid State Drive + 1TB Hard Disk Drive. The NVMe SSD drive is faster than the SATA SSD. This gaming machine runs on the Windows 10 operating system and got all the required ports and slots. For better multimedia experience, it has got ASUS AURA SYNC Customizable RGB Gaming Keyboard and Smart Amp audio technology which gives full gaming feel. 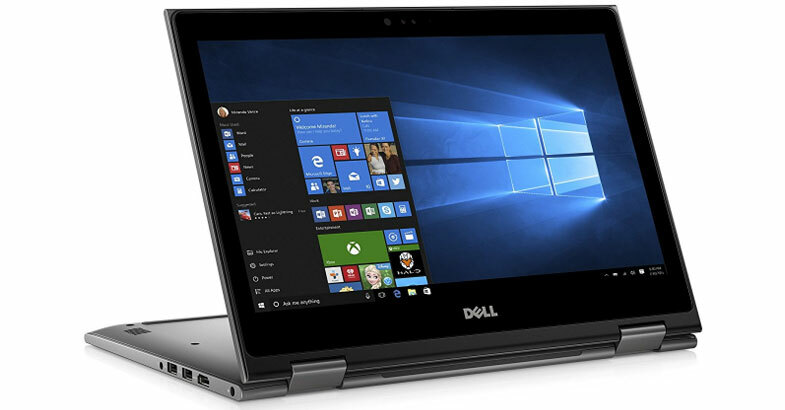 If you are looking for 2 in 1 convertible laptop with i7 processor then this Dell Inspiron 15 5000 laptop is a great option for you from the Dell. And the chassis of this device is finished in a Theoretical Gray which gives premium look and feels. Its 360-degree strong and innovative hinge allows you to use this laptop in four different modes. This convertible laptop has got 15.6-inch of full-HD IPS True-life LED-Backlit touchscreen display with 1920 x 1080 pixels of resolution. The touchscreen display of this laptop helps you to easily manipulate app and objects directly on the screen. If we move towards the specifications of this laptop then it has inside 8th Gen Intel Quad-Core i7-8550U processor with 8MB Cache and turbo up to 4.0GHz. To deliver a better and faster performance this device is equipped with 16GB of RAM and 512GB of SSD. And to handle casual gaming on this device it has integrated with Intel UHD Graphics 620. A worth mentioning feature of this laptop is its Windows Hello feature which helps to do easy login without a password. It comes with 2 x USB 3.0, 1 x USB 2.0, 1 x HDMI, 1 x Multi-Format Digital Media Reader and 1 x Headphone/Microphone combo jack for the multimedia connectivity. This Apple MacBook Pro 15 With Touch Bar is the latest model and it comes with all the latest and powerful set of hardware configuration. This is a powerful machine which can handle all the task with ease and without lag, which you will throw. If you are using heavy software like AutoCAD, photo/video editing, music production, etc. Then this is the best choice for you if you have a good budget. This MacBook Pro has got 15.4-inch of LED-backlit IPS technology Retina display with 2880 x 1800 pixels of resolution, which gives you an amazing working experience. For more natural viewing experience it features with True Tone technology, which can automatically adjust the white balance to match the color temperature around you. It has got the latest 6-core 8th-generation Intel Core i7 processor with 9MB shared L3 cache and Turbo Boost technology up to 4.1GHz. 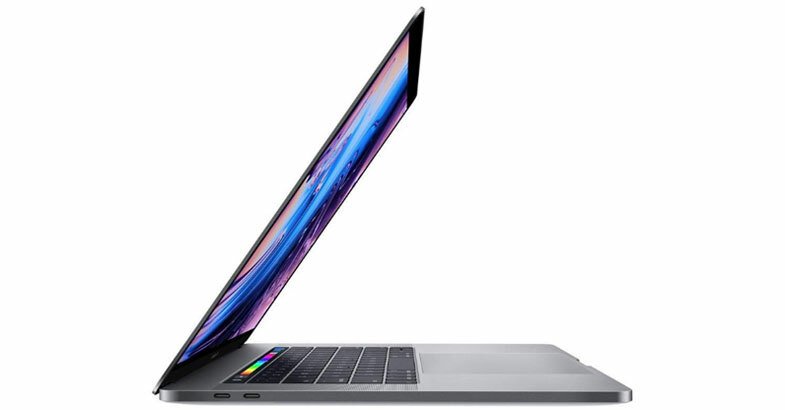 This MacBook Pro combines with AMD Radeon Pro 555X graphics with 4GB of GDDR5 memory, which gives a real-time performance for heavy tasks like 3D files in Final Cut Pro X. For faster performance during working on large files or doing heavy multitasking work, it is configured with 16GB of high-performance DDR4 RAM. On the storage front, it includes a 256GB of Solid State drive that is blazing fast, and it also helps to boot up, launch multiple applications or import huge files in a flash. If 256GB of storage space is not enough for you then you can go with its 512GB storage variant. The interesting feature of this notebook is its touch bar which automatically replaces the function keys based on what application you are using and show you relevant tools that are intuitive to use. For the connectivity, it comes with 4 x Thunderbolt 3 (USB-C) ports which are the most powerful and versatile ports ever. The battery life of this MacBook is impressive which provides up to 10-hours on battery backup on full charge. If you are looking for a powerhouse machine with gaming look for gaming then this ASUS ROG Zephyrus S laptop is a great option for you. 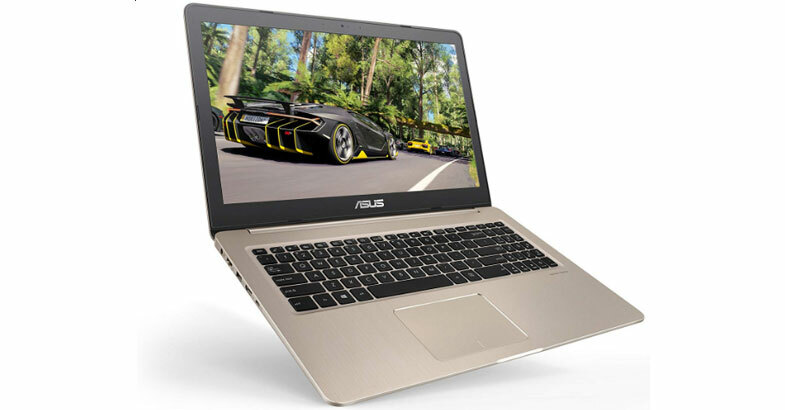 This ASUS gaming laptop is built with military-grade magnesium alloy with premium cover CNC-milled from Solid aluminum. And it has packed all the powerful specs in just 0.62” thin profile which weighs 4.6 pounds only. It sports 15.6-inch of full HD IPS display with 1920 x 1080 pixels of resolution. This gaming machine is powered by the 8th-generation Intel Core i7-8750H processor and coupled with massive 24GB of DDR4 RAM. If you are concerned about the graphics of this device it is equipped with mammoth 8GB of NVIDIA GeForce GTX 1070 dedicated graphics card with Max Q Technology. The storage segment of this laptop is backed by 1TB of NVMe SSD, which is faster than the SATA SSD. This gaming machine has ROG active Aerodynamic system with 12V fans which keep the system cool and provides stable performance during intense gaming or heavy multitasking. If you are a pro gamer then its customizable 4-zone ASUS Aura RGB Gaming Keyboard gives you a full gaming feel. We hope that this buying guide of the best intel core i7 processor laptops help you to choose the perfect laptop for yourself. Without any worry, you can buy any of the above laptops right now because we have done much research and then added to this list. If any of the above laptops does not fulfill your requirements then feel free to tell us your requirement we will find the best laptop for you as per your need and budget.